Titch the Itch, written by B.C.R. Fegan and illustrated by Lenny Wen, is the tale of an animated little itch who wants nothing more than to make friends the only way he knows how–by doing his job. 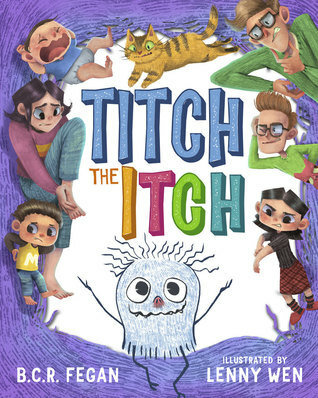 When his wayward, “no-reason-at-all” itching isn’t appreciated in the home of one large family, Titch the Itch seeks to make friends outside the home. Trying his luck with a cat, a neighbor, a police officer, and a park full of children, Titch learns that life is hard for an itch of his sort. His journey leads him to the hospital where he soon learns that he has had a bigger impact than he realized. B.C.R. Fegan has constructed a touching story centered around the personification of a lowly itch. The author has managed to take a difficult concept and design a precious plot surrounding the poor little itch’s desire to be needed and to have lasting friendships. Titch is a memorable character with whom young readers will empathize. As he moves from one character to the next, he experiences rejection and disappointment. Fegan has included some important lessons in this wonderful picture book. In addition to friendship, the author teaches the benefits of being determined and the results of perseverance. As with any children’s book, it is essential to include those moments of humor. Fegan does not lack in this area. The unforeseen circumstances surrounding the conclusion of the book are whimsical and encourage children to reread the book to find things they may have missed–a wonderful aspect to include to inspire young readers to delve further into the intricacies of text. As a teacher and parent, I more than appreciate those small amounts of mystery which energize readers. Kudos to the author! The illustrations for Titch the Itch are fantastic. Lenny Wen’s vision of Titch is a cross between a ghost and a friendly dust bunny–exactly how one might visualize an itch. The facial expressions of Titch absolutely make the story. His woeful looks tug at the reader’s heartstrings. The color schemes chosen to brighten the pages make this a beautiful story to read aloud. B.C.R. Fegan’s story of the needy little itch just looking for friendship is a sweet tale perfect for teaching young readers about the value of friends and loyalty. Posted on December 11, 2017, in Book Reviews, Five Stars and tagged adventure, amazon, amazon books, amazon ebook, art, author, bcr fegan, book, book review, books, cat, children, ebook, ebooks, fantasy, fantasy book review, fiction, friends, friendship, goodreads, illustration, journey, kids, kids book, kindle, kindle book, kindle ebook, kobo, lenny wen, life lessons, literature, mystery, nook, novel, parent, pet, picture book, publishing, read, reader, reading, review, reviews, school, social skills, stories, teacher, titch the itch, urban fantasy, write, writer, writing, YA, young adult. Bookmark the permalink. Leave a comment.